Hitachi-built Class 385 EMUs are set to enter service this summer after meeting stringent health and safety standards. The trains’ debut on the Edinburgh-Glasgow line was delayed earlier this year due to a safety concern with the “fishbowl windscreen”. This came after previous delays following the late delivery of the Edinburgh Glasgow Improvement Programme (EGIP) electrification programme. Approval from the Office of Rail and Road (ORR) includes a formal acceptance of the new flat windscreens for the trains, which was also accepted by the trade union ASLEF in May. 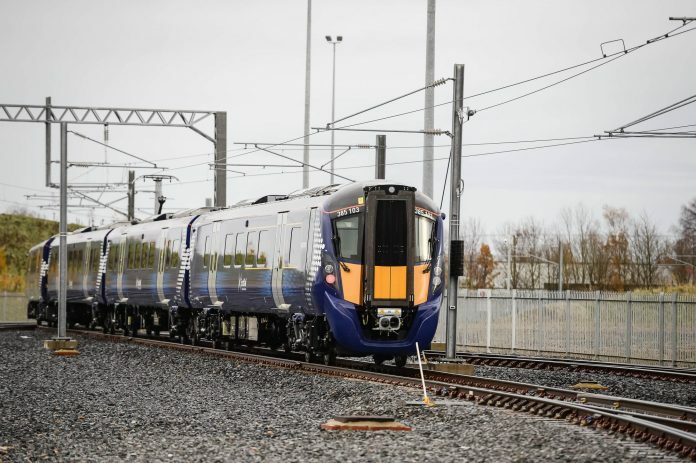 The new windscreens are being fitted on trains that are already in Scotland in Springburn, with the rest completed at Hitachi’s County Durham factory. Meeting the industry health and safety standards – a process known as ‘Type Authorisation – means that the trains now have a licence to carry passengers. The Class 385s are still undergoing thorough final internal testing and preparatory work before they can enter passenger service. Hitachi Rail programme manager Andy Radford said: “Getting the green light for new trains is a massive milestone for the project. At least its better than the Class 385’s entering service in December. With Class 365’s on hire for a year that will work alongside the Class 385’s and other EMU trains in Central Scotland. And with 10 more Class 385’s to be added if Abellio extends the Scotland Rail franchise to 8 years.